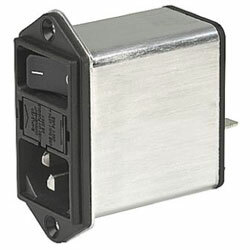 The Schurter DD12 is an EMV IEC C14 Power Entry Module with filter. It has a two-pole fuse holder, a two-pole non-illuminated line switch and 6.3mm x 0.8mm quick connect terminals. The module is available now from RS Components. The device is ideal for appliances with protection class I according to IEC 61140. The fuse drawer satisfies the demands of medical standard IEC/EN 60601-1. It is ideal for use in equipment according to IEC/UL 60950. The housing is made of black UL94V-0 thermoplastic. The device has an ultra-compact connector, ideal for low profile designs. All single elements are already wired and offer IP40 Protection rating. The device is ideal for Power Management and Medical applications.